In this SAP Press book chapter excerpt, find out how to complete standard payroll administration functions in SAP ERP HCM and make HR more efficient. processed and recorded efficiently, it helps the entire organization run more smoothly. In this SAP Press book chapter excerpt, learn how to complete standard functions in SAP ERP HCM payroll administration, including customizing pay stubs, performing adjustments, and updating payroll schemas and PCRs. You can create custom messages for employees and print the messages on their pay stubs. If you are running the in-house payroll software in SAP ERP HCM, you can send custom messages to a specific group of employees via their payroll stubs. For example, you could explain certain payments and deductions, changes in payroll contact information, service anniversaries, birthday wishes, and even upcoming events. You can do so by using Infotype 0128 — Notification — during a specific payroll period. Every employee selected to receive a pay stub will receive the message on their pay stub for the pay periods selected. This excerpt from 100 Things You Should Know About HR Management with SAP by Ajay Jain Bhutoria and Cameron Lewis is reprinted here with permission from SAP Press, copyright 2010. Download a PDF of this chapter. You can define additional information in Infotype 0128 that should be printed on your employee’s salary/remuneration statement. For example, you can print messages from management or birthday greetings. You can assign a text module to a personnel number using this subtype. 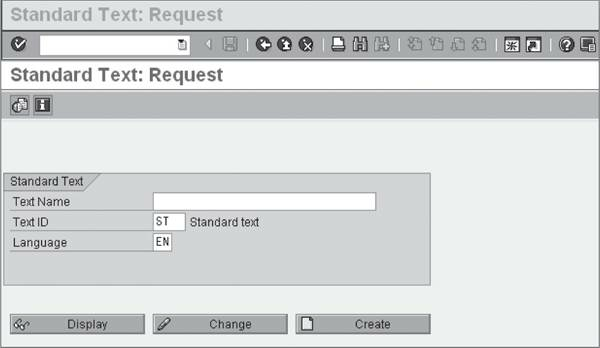 You should have created the text module previously using the function Tools • SAPscript • Standard text. You cannot edit the text module directly in Infotype 0128. To define additional information, simply go to the following menu path and enter the required data in the Text Name and Language fields. In the Text ID field, enter HR_G and choose Create. Next, choose Goto • Header, and specify a short title for the new text module. You should use a short title for all of the text modules you use. You can get a better overview within Infotype 0128, because the short title, not the text name, is displayed in the list screen or overview screen for the infotype. If you make a change to text module it will affect all of the personnel numbers that the text is assigned to in Infotype 0128. Using this subtype, you can edit an individual text module for the personnel number in question. You can only edit and display this text in the infotype. You can edit personal notifications in Infotype 0128. Using Transaction PA30, you need to create a record for the infotype. 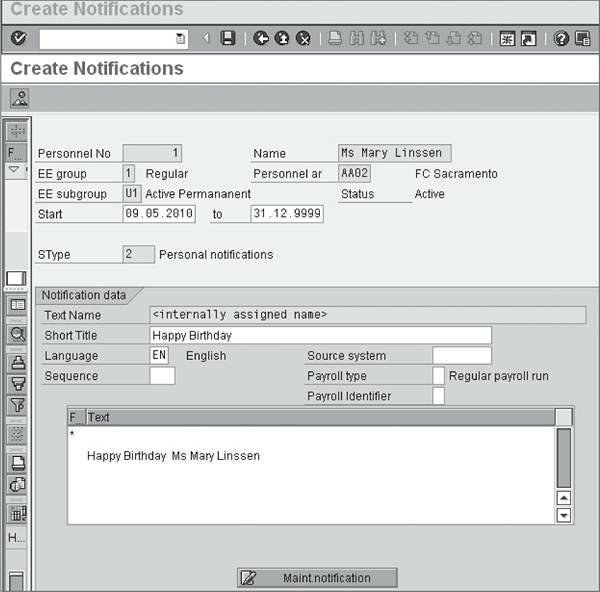 Enter the employee’s personnel number, select 0128 in the Infotype field and 2 in the Subtype field for a Personal Notification, and then choose Create. You can enter a short title for the personal notification. At the bottom of the window, you can enter the Personal Notification. If this area is too small, you can access the SAPscript editor via Maintain Notification. You can now edit the text again and Save when you are done. Select the appropriate Language and Text ID. You need to use Text ID ST (Standard text), as shown in Figure 1. Enter the message Text Name on the main screen; for example, a Happy New Year holiday message. Then click on the Create icon. The screen that appears, as shown in Figure 1, lets you type in the message you want your employees to see on their pay stubs. Click on Save. 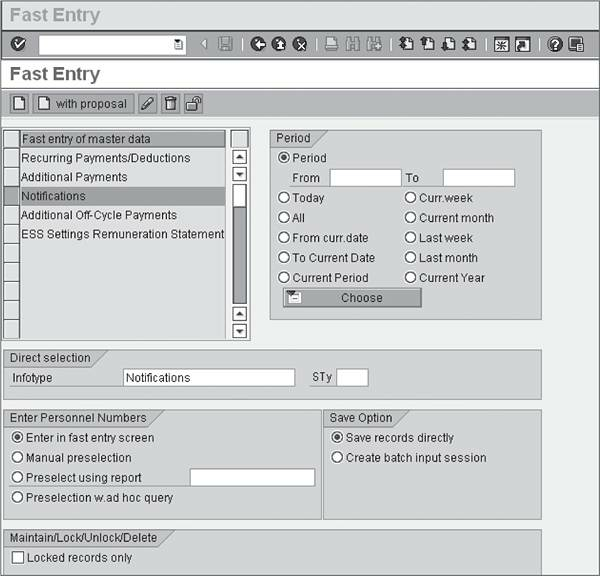 Now you can assign the message to a group of employees using the Fast Entry screen via Transaction PA70, as shown in Figure 2. Select Infotype 0128 and then click the Enter in fast entry screen button. Now you can create records for Infotype 0128 for multiple employees with your message. When the payroll is run for the period that has the date or date range in Infotype 0128 record, the chosen messages will appear on the pay stubs. The messages will not be included in payroll runs after the period on Infotype 0128. You can also enter Infotype 0128 via Transaction PA30. As shown in Figure 3, enter the short text title and the text message, and save the record. You can assign the Infotype 0128 subtype General Notifications or Personal Notifications to your payroll stub, as shown in Figure 4, and transport it to production after testing. You can manage special and year-end adjustments using Infotype 0221 — Payroll Results Adjustments. The data from checks written outside of SAP ERP HCM must be entered into the system to ensure correct year-to-date (YTD) calculations, consistency in reconciliation, and employee W2s that accurately reflect their taxable income. To carry out special adjustments, you can enter the wage types as an amount in Infotype 0221, and tax wage types to the appropriate tax authorities. You can specify up to 20 wage types per Infotype 0221 record with certain restrictions. By default, Infotype 0221 amounts are assigned to the employee’s tax company and tax authorities for the defined adjustment date entered on the infotype. The system, however, allows you to perform a tax company override or you can assign all wage types to a different work tax area, residence tax area, or unemployment tax authority. You can also assign the wage type amounts of Infotype 0221 to different cost object, such as a business area or cost center. In payroll, wage types entered in Infotype 0221 are assigned to the home cost center defined in the Infotype 0001 — Organizational Assignment. If you choose to assign a different cost object, all wage type amounts will be assigned to this cost object. This workbench facilitates the process of creating year-end adjustments and enables users to distinguish between the two available kinds of year-end adjustments: Subtype YAWA (with tax calculation) and Subtype YANA (without tax calculation). There is no restriction on the net amount of subtype YANA adjustments, and these adjustments can be positive or negative. Subtype YANA adjustments will cause a new final payroll result to be created for the prior year. A significant advantage of the year-end adjustment process under subtype YANA is that adjustments and master data changes won’t affect the year-end adjustment process, and vice versa. This functionality enables an extended period to check and reconcile year-end adjustment data. Furthermore, the year-end adjustment payroll run will only contain data for the corresponding year-end adjustment. When processing for YANA is complete, the system creates a special payroll result that contains all adjustment data in results table RT for the affected payroll period. This result will also update YTD amounts in tables CRT and TCRT. Because year-end adjustments entered on subtype YANA in Infotype 0221 are not considered by regular payroll runs, you may enter and reconcile data for year-end adjustments over an extended period of time, before you ultimately perform the payroll run for the adjustment. The year-end adjustment payroll run will only contain amounts that were created in Infotype 0221, as shown in Figure 1. You can maintain complex payroll schemas and Personal Calculation Rules (PCRs) easily and efficiently by using line commands and functions. Most administrators are not frequent users of payroll schemas, but do have to maintain them from time to time. Schema maintenance is a complex process, and it can be quite cumbersome to update them without knowing line commands and functions. Select the schema you want to update, as shown in Figure 1, and apply the line commands and functions for maintaining the schema. 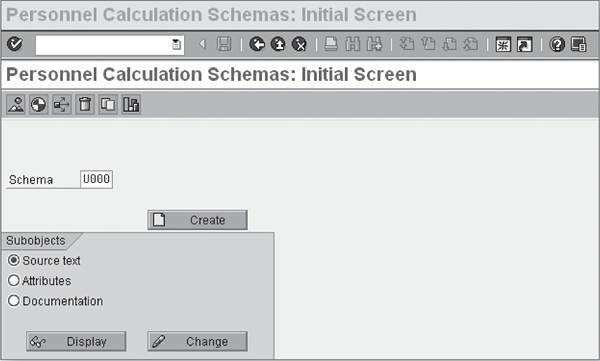 To access the schema, double-click on a subschema to take you to the maintenance screen for that schema. Double-click on any of the rules, you will be brought to the rule editor. By looking at the parameters, you can differentiate between a subschema and a PCR. You can call a subschema by using the Copy command. You can use the line commands listed previously to move, insert, delete, or copy a line. For letter commands, type the letter(s) and press (Enter). For example, if you wish to delete a line, type the line command D and press (Enter).